Blue and gold macaws are social birds known for their playful personalities and beautiful plumage. They do well in captivity, bond with their human companions and can be bred by knowledgeable owners. If you're planning to breed your macaws, you'll need to provide a nesting box to keep the family safe and give the hatchlings the protection they need. Whether or not you're a bird enthusiast, you've seen the small bird house tacked to a tree. This isn't that kind of house. A macaw nesting box is large, as both the male and female will need to fit comfortably within. These sizable parrots will need a box 36 inches wide, by 24 inches in length and depth. Macaws can be kept in cages, but flourish in larger aviaries. Prior to making the decision to breed and constructing a nesting box, you'll need to be certain your macaw's cage can house such a sizable structure. Once you have proper accommodations for your growing family, it's time to gather the materials and tools necessary for proper construction. Plywood with 1/2 inch thickness will work fine, but make certain the panels are sturdy. Macaws are champion chewers and can do a lot of damage to a wooden structure in a small amount of time. You'll need two full sheets of heavy plywood, a jig saw, protective gear, a drill, sandpaper or power sander and fasteners. One inch wood screws should be sufficient, and two small hinges will be needed for the top. Once you have your materials, it's time to cut your panels. Cut four panels 24 inches high and 36 inches wide. Two will be utilized for the front and back, and two for the top and bottom. Cut two additional side panels 24 inches square. 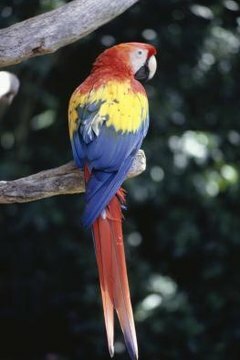 Sand all pieces to remove splinters or any rough edges that could injure your macaws. In the front panel, draw an 8-inch round circle, centered, near the top of the panel. This will become the entryway and needs to be large enough for one adult macaw to get into the box. Drill a hole in the center for a starting off point, and cut the hole with the jigsaw. Sand the entire area to remove any rough spots. Connect the side panels using the drill and wood screws. Secure the bottom, flip the box carefully, and add the lid, using the hinges. In spite of the designated entryway, the lid will need to be raised for regular checkups on the family, and after use, for cleaning. Once the box is complete, add a generous amount of pine shavings 4 to 8 inches deep to keep the family warm and secure, and provide a layer of bedding to protect the eggs. How do I Build a Jenny Wren House?